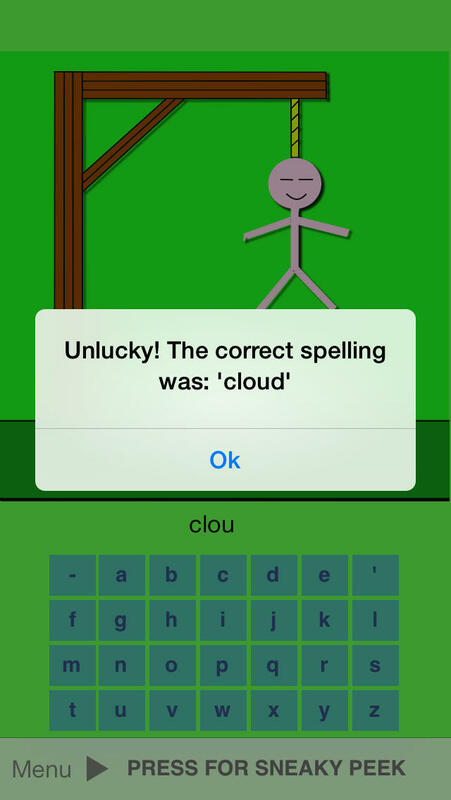 Spelling Hangman is a fun and easy to use app that will come in handy for young children when preparing for spelling classes. It’s fair to say that the app can be easily used in the classroom and incorporated in the regular curricula. The app receives a 4 star EAS Certification and with a few tweaks from the developer it can become a 5 star app! Spelling is such a fundamental part of a child’s literacy development and often is seen as a burden by learners. Playing spelling games can easily accelerate learning and what I like most about the app is that you can personalize your tests. The app has a very simple design that won’t distract the learner too much. I guess having a pretty app is a matter of taste and practicality but updating the design might make the app more appealing to the masses - they say not to judge a book by its cover but most off the time no one sticks to the this statement. 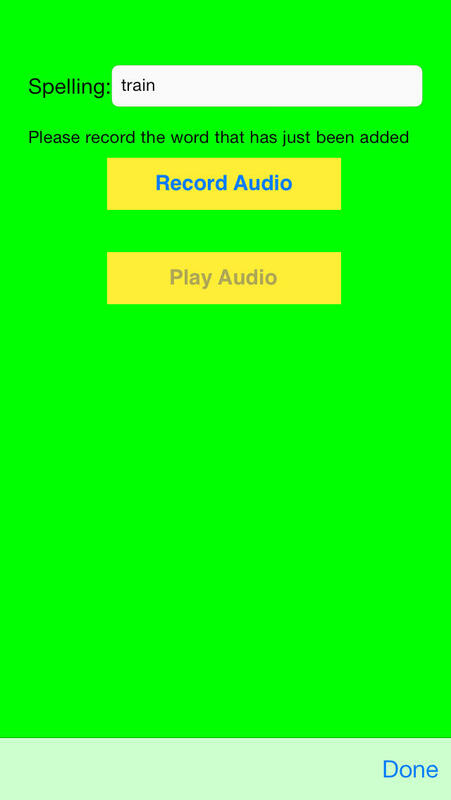 When opening the app you will see the main menu with 3 sections: “Play”, “High Scores” and “Configure Tests”. There is also a ”Setting” button on the top left corner that allows you to lock with a password the configuration section of the app where you can create spelling tests. This option is very useful because learners will not have access to the word sets created by parents or teachers. Before using the app you have to configure the tests. Tap on the “+” sign, choose you test suite name and start adding words. Make sure you type the word correctly and then continue by recording your voice. It’s better to record your voice in a room where there isn’t much background noise. You can play the audio so you can experience exactly what the learner will hear. If you are happy you can move on to the next word. You can create as many tests as you wish. When the learners start playing they will be able to select a test from the ones available. In the app, they will firstly hear the recording of the word, which can be repeated by hitting the play button at the bottom of the screen. Learners can use the keyboard to spell the word and as the traditional game of hangman goes, when a letter is missed a piece of the hangman picture will appear. After 5 wrong guesses the word will be revealed. If they guess the word the next one will be revealed until all the words in the list are finished. If a test will include a word written in capital letters, we discovered that the app will not recognise the word when you type it on the keyboard provided (which includes lower-case letters). This information should either be included in the app’s description or fixed. One other improvement that could be added to the app is related to the scoring system. If the test is repeated, all other scores are overwritten which makes tracking progress impossible if the learner is not overlooked by an adult. It would be good to be able to record every attempt and allow parents and teachers decide if they want to reset scores or just delete some entries. The app can be used as a personal “spelling log” because learners have different needs and the words that they will target can be different. The app costs £0.69, for the back to school period, and in the right hands can be a very good tool to practice spelling. 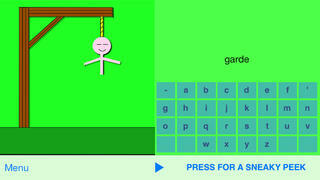 Spelling Hangman is a fun and easy way to prepare for weekly school spelling tests. To create your own tests, enter and record each of the spellings, then play a hangman style game with 'sneaky peeks' to help the learning process. You will enter each letter of the word in the correct order, but watch out, if you make a mistake, hangman will start to appear. Stuck? - press and hold the 'Sneaky Peek' button to look at the word. It might sound like cheating, but each 'Sneaky Peek' adds a hangman stage.